Would like to bundle all SymbOS activities now in this new thread. SymbOS 3.0 is still on its way, and during the last weeks there was a lot of activity especially regarding new CPC hardware support. Thanks to Dukes M4 Wifi/SD/Rom Board I got a lot of new motivations for SymbOS CPC since august, and Pulkomandys Albireo USB/SD/Serial board completed this in a great way as well. This version is not really 100% stable or designated as an R.C., but it's at least something you could try to see some progress and new hardware support. Especially when you want to try network on the Amstrad CPC in a multitasking environment, which is really a cool experience. 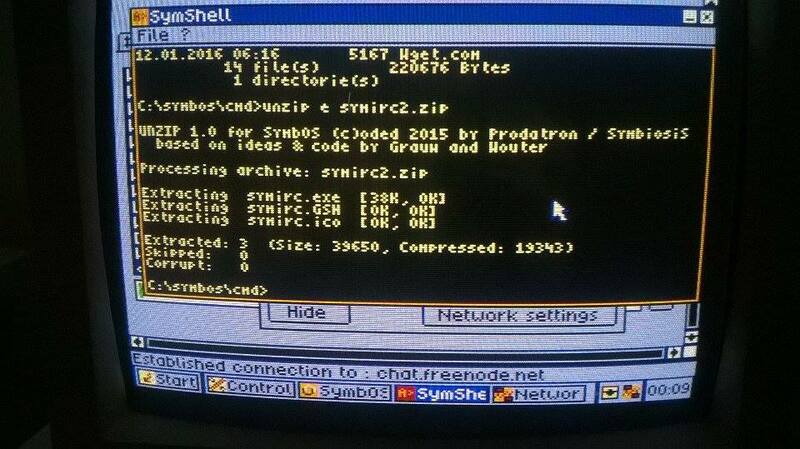 This package contains another preview of SymbOS 3.0 - CPC edition. - software package including UNZIP etc. several SymShell (command line) based available in the /SYMBOS/CMD directory. EdoZ developed in Quigs by Trebmint. large files from websites you may get corrupt data or even filesystem errors. Usually this happend for files > 1MB but it can happen at any time as well. tests. Duke and I are still working on finding and fixing the last issues. leve access it runs much more stable now compared to the previouse versions. mouse is moving. So it's a little bit tricky to use the mouse currently. Any bug reports etc. are very welcome. But please note, that especially the M4Board wifi and the Albireo USB mouse support is not 100% finished/stable yet, so in this case you will see issues in any case. Anyway I hope someone of you will enjoy this update. Big kudos for this amazing work, it is truely impressive. Duke, you are right, EdoZ reported the same, he is now using irc.freenode.net . there is 16 users, but nobody is talking? Good NEWS! Very cool that others now can test it as well. Yes i also noticed about the verne .. i changed my app to chat.freenode and that seems to work fine. I builded a new version. how about download it from a cpc? use WGET in SymbOS and unzip it in SymbOS! You can find WGET.COM and UNZIP.COM in the CMD directory bdw. I'm able to download SymIRC.zip via wget and could unzip it. So, network connection works well. After starting SymIRC, entering nickname and try to connect then SymbOS crashes. By the way. The new Desktop is very well done! I had some troubles with the combination of WGET and UNZIP on the CPC today as well. Anyway thank you for testing so far! I hope we can fix these issues soon! ...maybe the ZIP was already corrupted due to the download. what is the required hardware to use TCP/IP with SymbOS ? And if you want to run some applications you need internal memory as well..
Ops.. And if you download it with checksum in unzip? or just use a PC Is it always doing this? Or was it once? As it seems the first step of connection with the IRC server was ok.. I a gonna try this tonight. Last night got away from me as I was playing RGB, H.E.R.O. and battlezone on my 'new' Atari 130xe tonight is symbos and mahjong time! I just did it like you described before in the picture above. I downloaded the file via CPC from SymbOS shell with wget and unzipped it. But I didn't check the checksum. What I actually did was downloading the file (SymIRC.zip) and started unzipping. The first time unzip was frozen (it did nothing but printing the first two information lines and then stopped). I killed the shell, restarted it and tried to unzip the file again (just with unzip -e ...) and it seems to work. But the application crashes after trying to connect the server. I will try later with a checksum performance. If it doesn't work then I will try PC data transfer. You can do unzip t SYMIRC.ZIP to test the zip file. But what i see is that probably the archive was damaged during download with wget. That is probably the reason. OK, For me the M4 Mass Storage is not working. I have tried multiple SD cards... on all of them the symbos folder is inaccessible so nothing works. I so wanted to get the CPC online. Is this the ERROR in SymbOS? Error 33 means "Destination is no Directory"
Can you do START, RUN, BROWSE? If so! .. can you check if the SYMBOS path is correct? See page 21. of the manual. 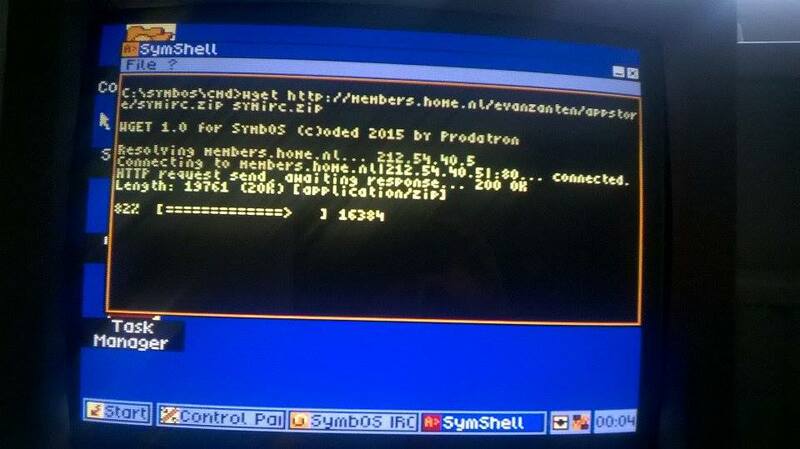 Also did you try to rename SYMBOS1.INI into SYMBOS.INI? Start run browse works fine and opens all folders... Except symbos (error 33). All folders are perfectly accessible from basic with no issue. Strange issue :/ In SymbOS you can access all folders with the expection of /SYMBOS/ itself? And it is still loading the wallpaper (it's placed in the SYMBOS folder, so at least during booting this folder seems to be accessible). Maybe you can rename/remove the /SYMBOS/NETD-M4C.EXE (network daemon) so it will not autostart it at the beginning? Maybe this is causing issues after booting. You should also check the filesystem integrity again.